Late last year, Whole Foods Market predicted that pomegranate molasses and its offshoots would rule restaurant menus and grocery store shelves in 2017. They were right! What exactly is a pomegranate? The name pomegranate stems from the latin words “pōmum” (apple) and “grānātum” (seed). Pomegranates are large, round fruits with a thick red skin originating from the Himalayas. They contain loads of ruby-red, juicy seeds lauded for their health benefits and have received praise throughout history by various civilisations and religions. Nowadays, health-nuts (like us) label pomegranate seeds as a superfood. 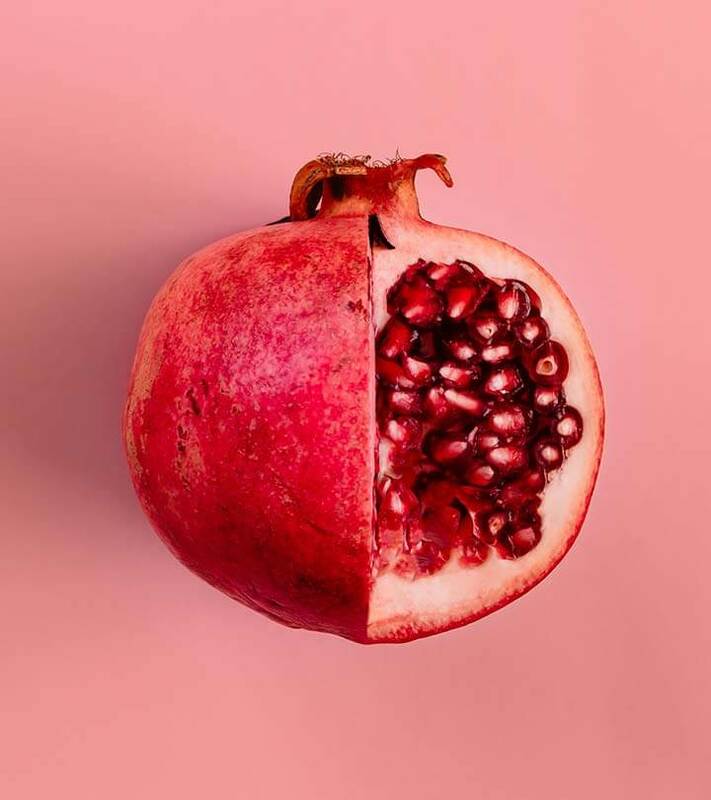 Having natural anti-inflammatory properties thanks to their high content of hydrophilic antioxidants, a healthy diet containing pomegranates can lower the risk of heart disease, diabetes, Alzheimer’s disease and obesity. They also help prevent inflammation in the colon while aiding with diarrhoea. The most valuable assets that pomegranates have however, are their vitamin content. They’re absolutely loaded with nutritional goodness. Often too much for us to even absorb all in one go! The pomegranate is considered one of the healthiest fruits there is, as well as arguably the tastiest. The thick skin is generally inedible leaving only the seeds, (or arils), to eat. You can eat the arils raw or after they’ve been processed into juice. 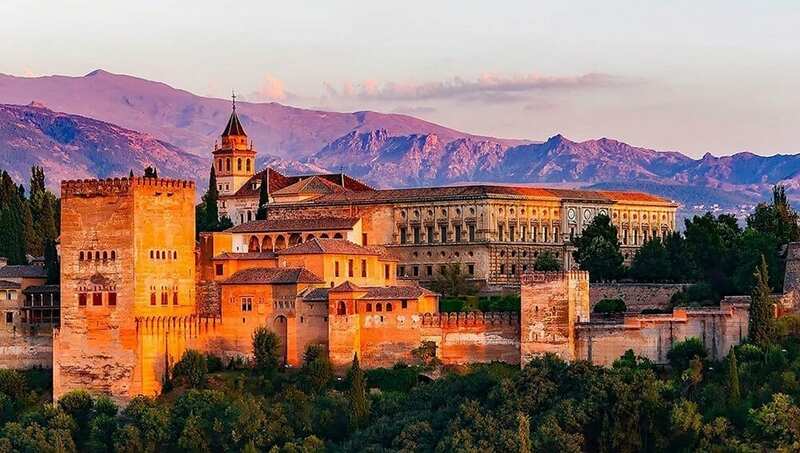 The city of Granada in Spain uses the pomegranate as it’s heraldic crest. Coincidentally, pomegranate in Spanish is “granada”. Though it’s easy to think the city is named after the pomegranate, the leading theory is that it stems from the Arabic word “Ġarnāṭah” or “hill of strangers.” How broody. The pomegranate is technically a shrub or small tree bearing the pomegranate fruit, though the fruit quickly inherited the name. The fruit is also botanically a berry-the seeds and pulp are produced from the ovary of one flower. 1. Score around the middle and tear the pomegranate into two halves. Cut deep enough to penetrate the thick skin, but be careful not to cut into the seeds. 2. Hold one half over a bowl with the open side facing down, then lightly tap the back of the fruit with a spoon. You can also squeeze the fruit at the same time to release more seeds. 3. Repeat with the second half. 4. Use the spoon to slowly scoop out or loosen up any stubborn seeds. 1. Score the fruit around the middle. Again, make a deep cut but avoid cutting the seeds. Pull the two halves apart. 2. Submerge both halves into a bowl of water and gently squeeze the fruit around the edges and separate it. 3. 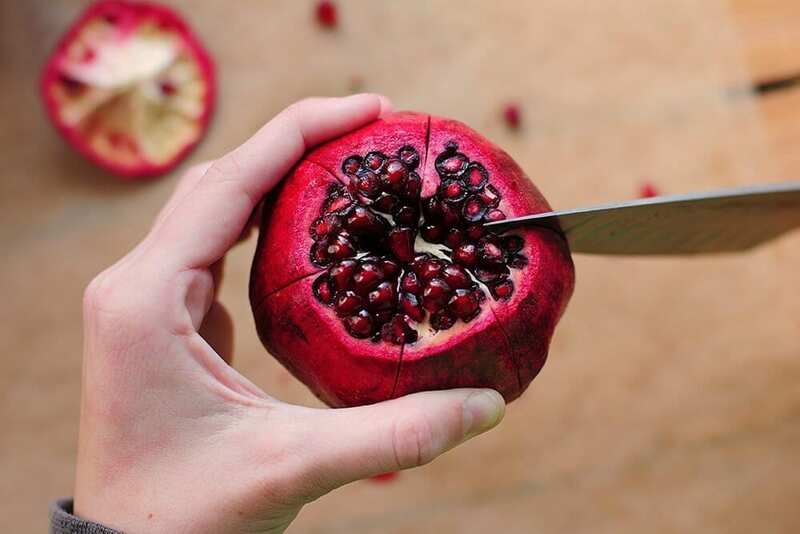 Once the water has softened the white tissue inside the fruit, also known as the pith, remove one half of the pomegranate and hit the back of it with a spoon. The seeds should simply fall out, into the bowl of water. 4. Use the spoon or your hands to remove any stubborn seeds. 5. The seeds will sink to the bottom of the bowl, so use a sieve or pasta spoon to remove them. Whole pomegranates can be kept on the counter if you plan to eat them within a week. Ideally, they should be kept in the fridge to prolong prevent them from going bad for up to 3 weeks. If you notice the pomegranate is very soft or light, it’s possible the seeds inside have gone bad. Once the seeds have been extracted they should be kept in an air-tight container in the fridge or freezer. Seeds can be kept for up to a week if refrigerated or up to 2 months when frozen.